Who is most at risk for dry eye? Seniors, people 50 years of age and older are more likely to experience dry eye symptoms, but dry eye can develop at any age. Research has estimated that almost 5 million people in the United States, age 50 years and older have dry eye already, and 3 million of these are women. Many millions more Americans are suffering with mild dry eye symptoms due to extensive time spent on electronic devices and on computers. As well, for women, dry eye is very common after menopause. Women who get early onset menopause are also at higher risk for damage of the surface of the from dry eye. Can medicines cause dry eye? Dr. Greene: Yes, many medications have a side effects that can cause dry eye. If you are taking medications over long period of time it can get sever. Some of these medications are: nasal decongestants, antihistamines, birth control pills, anti-depressants, tranquilizers, certain blood pressure medicines, estrogen replacement therapy, and Parkinson’s medications. 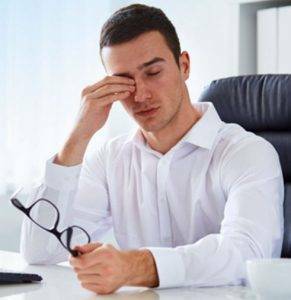 Dr. Greene: As a dry eye specialist, depending on the severity and exact cause of the patient's dry eye we will utilize any and all of the best treatments available. The treatments can be one or, a combination of: artificial tears, punctal plugs, prescription eye drops, warm compresses, steroids, and vitamin supplements. Your Americus, Montezuma, and Leesburg eye exam will include testing for signs of macular degeneration too!